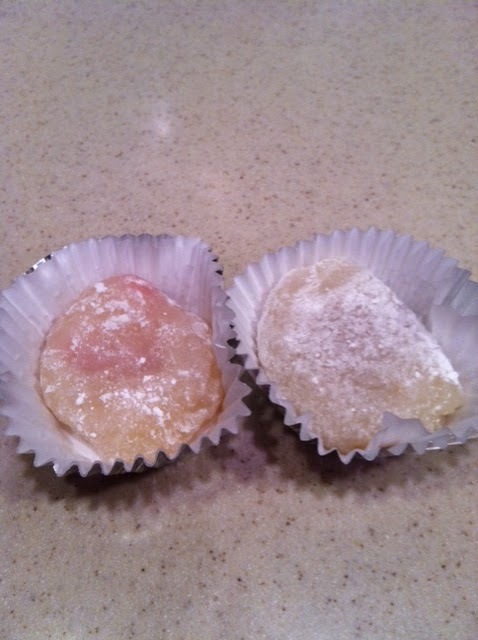 The Helpful Home: Microwavable Peanut Butter Mochi Strawberry Mochi Recipe--yummy and easy! Microwavable Peanut Butter Mochi Strawberry Mochi Recipe--yummy and easy! Mix mochiko, sugar and water until smooth. Pour into slightly oiled microwave tube pan. Cover with plastic wrap and microwave on high for 6-8 min. Turn over on plastic cutting board covered with katakuriko or cornstarch. Cut mochi into 12 wedges. Coat hand with katakuriko or cornstarch and and flatten mochi. Place a teaspoon of peanut butter, or strawberry, in center of mochi and bring edges together and pinch to close. Note: If you use fresh strawberry, cut mochi into 8 wedges. I microwaved mochi for 8 min on high and it came out a little overdone. Next time I'm going to do 6-7 min. Cooking time will depend on your microwave.